As meaningful use requirements take shape, the transcription industry reexamines its role to find where it best fits. The medical dictation and transcription industry has changed gradually over the years, but recent developments suggest the pace is going to pick up. The growing demand for improved speech-recognition and data-mining technology, the ever-changing role of medical transcriptionists (MTs), and the megamerger of MedQuist and Spheris will have a significant effect on the business in the years ahead. And while each of these factors will hasten the transformation, EHR meaningful use requirements will add urgency to the process. Because of the funding attached to meaningful use achievement, medical facilities are no longer wondering whether they should implement EHRs; they’re trying to figure out how to do it. Then they must make the big leap from EHR adoption to meaningful use. To that end, many in the industry see developments in speech-recognition technology as a way to get more information from existing data. As front-end speech recognition has made inroads into the traditional dictation market, healthcare providers are becoming more comfortable integrating it into their workflows. And because meaningful use rules will require core measure reporting, companies have begun to explore methods for mining the patient encounter narrative to compile that data. For this reason, the demand for not only more efficient but also more intelligent speech recognition-technology has never been greater. But the technology that will allow the type of interactivity required for meaningful use is still evolving. Most EHRs use templates and drop-down menus to produce reports. Templates can help standardize the reporting of certain types of data, but they can’t encompass all the necessary information related to the patient encounter. Efforts to effectively mine that patient data narrative are picking up steam, but Gerdes cautions that there is a lot more work to be done. He believes industrywide standards will need to be established before effective information exchange can take place. Besides faster, more comprehensive dictation, another issue for doctors is mobility. With the rise of smartphones, doctors have shown interest in using the devices, especially when they’re rounding. “The idea is to be able to dictate a note quickly on an iPhone or view it either there or later when they get back to the desk and not have to go log into a PC to go to the EHR or pick up a standard telephone,” says Durlach. As these capabilities become more widely available, demand is certain to grow. Along with doctors and hospitals, patients are also beginning to take an interest in digital record keeping. Although the possibilities for PHRs have barely begun to be explored, Scott Faulkner, principal and CEO of InterFix, LLC, a provider of technology solutions for HIM and medical transcription, believes this trend will become more prevalent. How that affects medical dictation and transcription remains to be seen, but Michael Clark, chief operating officer (COO) of medical transcription service provider MedQuist, believes the industry will be a major player in connecting PHRs with EHRs. “The medical transcription industry will play a critical role in repurposing health information for multiple applications and serve as a bridge between electronic health records and personal health records,” he says. Bridging that gap and meeting the increased needs of medical providers will require not only more information but also more useful information. 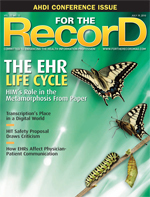 “The once-and-done model where after this information is processed it’s populated into the electronic health record and then it’s immediately actionable—clinically, financially, operationally—requires a more quality, precise document,” says Jay Cannon, president and COO of medical transcription service provider Webmedx. In addition, the need for faster, more accurate information will undoubtedly have an effect on MTs. In recent years, the MT shortage that was once considered inevitable has been held at bay by technological advances. And offshoring has provided the flexibility for some companies to provide 24/7 service. But the effectiveness of offshoring has limitations because of the need for increasingly skilled workers and restrictions in the ARRA legislation. Because a highly skilled, domestic transcription base will continue to be a necessity, the MT’s role will continue to evolve. While technology has helped maximize the talent pool, it also requires workers with a greater range of skills. There is still a demand for about 40 billion lines of transcription each year, but estimating how many new MTs may be needed vs. how much of that capacity can be covered by emerging technologies is an ongoing debate. Faulkner believes medical transcription, coding, and billing will eventually converge. MTs and other quality assurance people will need to acquire additional skills to stay relevant. Gerdes adds that a highly trained workforce will be a key to processing data in a way that will allow the information to be mined effectively. “We’re finding, as we get into clinical data and clinical document architecture and the need for data by hospitals, our editors are becoming knowledge workers,” he says. It will be difficult for medical transcription and dictation companies to leverage their technologies and human resources to meet healthcare providers’ increasingly high expectations. Although EHR adoption has become an important goal for many institutions, healthcare organizations want actionable data for additional reasons such as improving patient care, managing patient load, reducing costs, and billing accurately. Those functions require a higher level of interactivity and connectivity than current medical transcription and dictation models. As patient volumes increase, healthcare providers will increasingly look for dictation and transcription solutions that encompass the entire patient encounter while providing more information than ever before, and they will want to use that information as they deem necessary. These factors will increase the pressure on vendors to add value to their offerings. Ultimately, speed, accuracy, and flexibility will determine which solutions are most successful. These changes are likely to have other consequences as well. Although the industry recently saw the consolidation of two of the largest players, MedQuist and Spheris, tougher competition and the big EHR push will likely accelerate the consolidation trend. Kivi believes affordable technology solutions designed to help smaller practices meet HITECH and ARRA requirements will be the biggest area for technology growth in the coming years, since there is currently a market void in this area. The fact that consolidated companies will be able to achieve economies of scale and put price pressure on their competitors adds to the challenges for smaller companies in the industry. Navigating the maze of meaningful use requirements and dealing with a changing workforce will continue to be challenges for everyone. Perhaps the biggest challenge, though, will be meeting the needs of customers who favor an increasingly integrated and comprehensive approach to patient data. To remain viable, medical transcription companies will need to deliver reports with structured data designed to achieve more for their healthcare provider clients than they have in the past.